Don't wait for a special occasion to prepare grilled lobster tails. This fancy seafood selection doesn't require much time to make, which means you can dine on a succulent gourmet seafood dish in less than an hour. Grilled lobster is extremely versatile. It can be served on its own or added to a variety of dishes including salads to stews, sandwiches, soups and spaghetti. Once you begin experimenting with grilled lobster, you will realize a little meat can go a long way in adding a touch of gourmet to ordinary dishes. The secret to creating grilled lobster tail is to not overcook the meat. As soon as the shell is red and the lobster meat is tender, juicy and opaque, it's ready to serve. Most home cooks keep it simple when serving grilled lobster. The majority use melted butter and lemon or lime juice to baste the lobster. However, soy sauce, pineapple juice and Worcestershire sauce can also be substituted as the base for a delicious marinade or dipping sauce. The key is to use ingredients you enjoy, to create your own unique flavor. 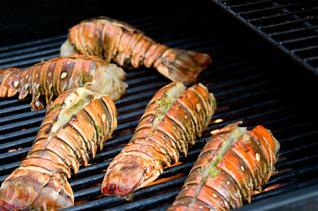 Before you begin cooking, you will need to prepare your lobster for cooking on the grill. If you bought live lobsters, you will need to kill and clean them. Otherwise, you can butterfly the tails with a sharp chef's knife. To make vinaigrette: In a medium bowl, whisk the mustard, shallots, grapefruit vinegar and lime juice. Slowly whisk in the grapefruit oil and the extra-virgin olive oil. Stir in the herbs, salt and pepper. Set aside. Cut the avocado in half lengthwise. With a spoon carefully remove the avocado meat. Reserve the shells. Dice the avocado into 1/3-inch pieces and place in a mixing bowl. Add lime juice and cover with plastic wrap. Remove the lobster meat from tail and parboil for one minute. Place lobster meat on the grill basting with butter for about one minute per side. Remove lobster from the grill and dice into bite-sized chunks. In a large bowl, gently mix the avocado, lobster, red bell pepper, jicama and onion. Drizzle in half of the vinaigrette and carefully stir to mix evenly. Generously stuff the avocado shells. Place a bed of butter lettuce on chilled salad plates and place avocado half in center of plate. Garnish lettuce with pine nuts, onion and tomatoes. Drizzle remaining vinaigrette over salad. #Serve immediately. Lay lobster tails on a cutting board with the soft side of the shell facing up. Using a sharp knife, cut the tails in half lengthwise through the shell. Loosen meat with fingertips. Brush lobster meat with oil. Lay the tails on the grill, cut-side down, and cook until the meat is white and the shell is red, about 5 to 6 minutes. Turn and continue grilling until the meat is opaque, about 2 to 4 minutes more. Transfer the lobster tails to a cutting board. Toast buns over indirect heat, 3 to 5 minutes. While the lobster cools, bring a small pan of water to a boil. Cook snow peas until bright green, about one minute. Drain, rinse under cold water and slice very thinly. When the lobster is cool enough to handle, remove the shell and coarsely chop the meat. In a large bowl mix celery, mayonnaise, lemon juice, shallot, mustard, tarragon, pepper, salt and garlic powder. Stir in the chopped lobster meat and snow peas. Divide the salad among the toasted buns and serve. Reduce cream by half over low heat. In a separate pan, cook the artichokes, tomatoes and lobster meat in the sherry. Add scallions and cream. Cook the pasta in hot water and drain well. Add to the lobster mixture and heat thoroughly. Learn how to incorporate grilled lobster into your weekly dinner menu by visiting LovetoKnow recipes. There you'll find dozens of simple recipes for delicious lobster dishes.